Increasingly we find that modern homes are well insulated but very poorly ventilated. Condensation, mold, mildew growth and dust mites are proving to be a major issue in New Zealand households. Generally, in the winter we tend to keep our houses sealed up in order to retain heat that we have paid to generate and to keep the cold air out. Warm air retains moisture better than cool air, so humidity will build up. When warm air contacts a cooler area such as glass windows, condensation occurs. Over time this results in mold, mildew and the perfect conditions for dust mites to breed. This is where Degrees Ahead can help. We provide high-quality systems which can ventilate your home 24 hours a day 7 days a week. In the past, a limited solution would be to open a window but this does not allow adequate ventilation and possesses a high security risk. 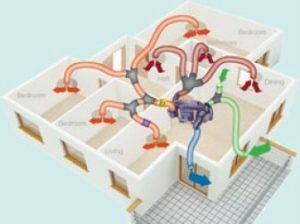 Our systems pass the ventilated air through a high-grade heat exchanger and filter before being gently distributed around the home via diffusers set in the ceiling at strategic points. The continuous circulation of fresh dry air creates a positive pressure in the home which pushes the damp stale air out of the home. Greatly reduce condensation, mold mildew, damp and other airborne contaminants in your living spaces. Introduce clean fresh air whilst maintaining the security of your home. Provide a clean healthy living environment in your home. Drive moisture and contaminants out. Continue to provide fresh cool air during the summer months and on hot days during Autumn, Winter and Spring. Saves money on your heating and cooling costs. Integrated into some of our systems is a heat transfer feature which recovers excess heat from your heat source to warm the rest of your home. Where there are public gatherings or workplaces within the commercial buildings all such places since 1992 must provide satisfactory Fresh Air & Ventilation to the NZ Standard 4303-1990. This is a special custom design requirement and can involve the basic need of outside air introduction via a filtration module or be a full climate control system with integrated temperature and humidity control, with energy recovery. Degrees Ahead have designed, supplied and professionally installed a vast number and varying types of systems in many different industrial and commercial sectors around the Hawke’s Bay area. We use a range of quality proven products from leading manufacturers to design our solutions. Contact us to request a design to meet your specific business needs. Every system provided and installed by Degrees Ahead is covered with a manufacturer’s parts and labour warranty and an installation and workmanship warranty. Click on the Daikin Warranty button below to find more details about each warranty, or contact us and we will explain it all in person. Contact our team today for a completely FREE, no obligation quote or proposal. We are here when you need us to service both your residential and commercial needs! We offer heat pump maintenance and repairs. You will also find our quotes VERY competitive and we offer an obligation free home visit to find out what system will fit your needs. Contact us today to book a Degrees Ahead consultation, or to learn more about the systems we can provide.